The United States says it will allow outgoing Yemeni President Ali Abdullah Saleh to come to the U.S. for a limited time to undergo medical treatment. A State Department release Sunday noted that Mr. Saleh's travel request had been approved for the sole purpose of such treatment, and that his expected stay in the U.S. will be short. Earlier in the day, Mr. Saleh departed the Yemeni capital, Sana'a, on a jet for the Persian Gulf sultanate of Oman, where he is expected to stay for a short time before traveling on to New York. 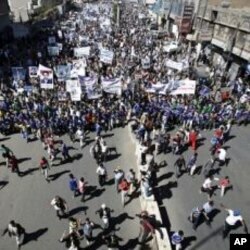 Yemeni protestors march during a demonstration denouncing the immunity law passed for Yemen's President Ali Abdullah Saleh in Sanaa, Yemen, January 22, 2012. In a televised farewell speech just hours before he left, the Yemeni leader asked his people to forgive him for mistakes made during his 33-year autocratic rule. He also vowed to return to Yemen and continue leading his ruling General People's Congress party. Mr. Saleh was severely wounded in a bomb attack on his presidential compound last June and spent several months recuperating in Saudi Arabia. He has spoken previously of a desire to seek further treatment in the United States. Yemeni opposition activists have staged a year of mass protests demanding his immediate ouster, inspired by popular uprisings in other parts of the region. Thousands of Yemenis rallied in Sana'a Sunday, calling for Mr. Saleh to be put on trial for a violent crackdown on the demonstrations in which hundreds of people have been killed. The anti-Saleh protesters reject a law that grants Mr. Saleh full immunity from prosecution. Yemen's parliament approved the law Saturday, as part of a Gulf Cooperation Council-backed plan to encourage the president to leave office. Mr. Saleh signed the plan last November and agreed to transfer presidential powers to his deputy ahead of February elections that will pick his successor. Yemeni Vice President Abed Rabbo Mansour Hadi is the consensus candidate of Yemen's ruling party and parliamentary opposition for that election. In Mr. Saleh's meeting with party officials, Yemeni state media said he declared Hadi responsible for the country and promoted the vice president to the military rank of field marshall.